Join 147,212 other nutrition professionals. Learn the science and build your expertise in specialised areas. What’s your Weight Gain Probability Score? Five a day… or 10? How can you be sure of food labels? Includes a FREE surprise bonus! 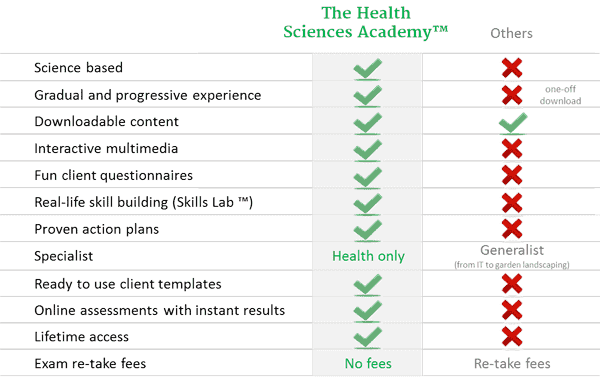 The Health Sciences Academy ® is the largest online educator on nutrition science in the UK, focusing on science-based certification courses recognised by government-regulated awarding bodies, from Sports and Exercise Nutrition, to Clinical Weight Loss, to Advanced Supplements. Everyone is confused by a mass of conflicting health and nutrition information. There are hundreds of "dietary theories" out there, but they all miss the most important thing: the SCIENCE. That's why our certifications are built around science-based methods and resources, so YOU can become the expert. Our lessons and practical materials are 100% researched and developed by us. Yes, we are a team of scientists and researchers who are at the forefront of nutritional sciences and feel incredibly passionate about making a meaningful difference. Meet us HERE! What works for you, may not work for someone else. Why? Because everyone has a different biochemistry, genetic makeup and nutrient needs. Discover your next specialised certification here. Or try a FREE mini-course now. Our online lessons and practical materials are 100% engineered by our very own team of scientists and researchers. This way, we provide students with reliable science-based knowledge and hands-on tools, helping them to develop their own expertise. As opposed to passive learning, we encourage an active and creative discovery, whilst offering a gradual and interactive learning experience. 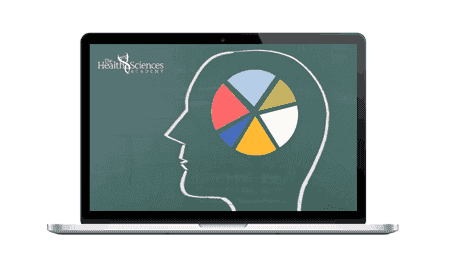 Through an easy to use state-of-the-art multimedia platform, students can take interactive quizzes, participate in live polls, complete online assessments, download printable worksheets for use with their clients, and put their knowledge in practice through Skills Lab™. There is nothing else like it. Build your expertise in a specialised area to advance your career and broaden your client base. Learning Online was very enjoyable, looked forward to completing more every single day! It will help me 100% with my business! And I love the interactive features. Learn anywhere from any device. It's interactive and fun. REASON 1. There are too many conflicting "dietary theories" out there. The problem is that they are formed on the basis of personal opinions, without adequate interpretation of the SCIENCE. You can either waste a year absorbing misinformation, a hundred opinions and unproven theories - OR we can teach you how to interpret the science so YOU can become the expert. REASON 2. Holistic teachers and celebrity "experts" enchant fans with a mass of pseudo-science. But our students know better and are eager to learn the science from the scientists themselves: meet us HERE! We actually ARE SCIENTISTS who investigate, dissect, test and teach science... Our skill is to cut through junk studies and unproven theories, so you can finally learn what really works - and what doesn't. REASON 3. Anybody can provide others with nutritional advice. The problem is: many base it on hear-say, things they've read (out of context) or what worked for them (which may not work for someone else). Our mission is to mitigate the risk of wrong advice. Through science-based guidance, templates and practical exercises, we make this possible. REASON 4. Most educational programs provide generic nutritional information, leaving out your unique biochemistry and nutrient needs. But we don't. We teach our students how to evaluate individual requirements and how to create personalised plans. That’s why our certifications are built around science-based nutrient assessments and proven planning tools that help you discover the best approach for you and your client. REASON 5. The majority of nutrition courses don't cite scientific sources and often misinterpret, oversimplify or exaggerate information. We're different. We provide our students with the latest scientific research from peer-reviewed journals, including references and additional resources so they can expand their knowledge and continue with their own research. REASON 6. Unlike other providers, we don't have a hidden marketing agenda where they heavily advertise book authors and have no original content to teach you. We self-fund all research activity (that's why you won't find any ads or promotions on our site). Our content is original, 100% researched and produced by us, and you won't be able to find it anywhere else (unless we specifically reference it). Plus, our certifications are recognised and audited by government-regulated awarding bodies. REASON 7: What's the point of learning the science if it doesn't get translated into practical advice? Our skill is to examine complex scientific studies and translate them into easy-to-understand practical concepts for our students. This way, we deliver science-based knowledge and practical tools, helping our students become specialised nutrition professionals and make a meaningful difference in other people's lives. REASON 8: We make science fun! We love to ignite your brain cells with new discoveries. Want to join us? Choose your next field of specialisation here. Or simply get started with this FREE mini-course. You too can make a difference. Join others who are successfully working with their own clients. A trusted source for science-based knowledge. We'll teach you the science so YOU can become the expert. © 2019 The Health Sciences Academy ® All Rights Reserved.